I’ve had some frustrating experiences in garden centres recently and I’m becoming increasingly disillusioned with them as places to spend my cash. We’re bombarded with the word choice whether it’s where to have an operation, which school you send your children to or the seemingly infinite number of breakfast cereals on offer. And yet you wouldn’t think so if you visited a selection of garden centres. My attention has been somewhat diverted this spring and summer with all my seed sowing and plant nurturing energies focussed on the plants needed for my book rather than my garden. Once the plants were all happily growing away at the plot I noticed that my garden needed a bit of a lift. Gaps had appeared where bulbs had died down and I didn’t have any plants lurking around to fill these spaces. I didn’t want any perennials, just something that would provide lots of flowers over a long period of time. I didn’t think it would be a problem to find something and paid a few visits to my local garden centres. How wrong could I be. I have never been a fan of bedding plants. It seems like gardening for Lilliputians. So many lovely plants that have been bred to be small, which end up losing any charm, and often in the process any pollen and nectar too. I appreciate that some of them have a place in hanging baskets and possibly certain municipal planting schemes. 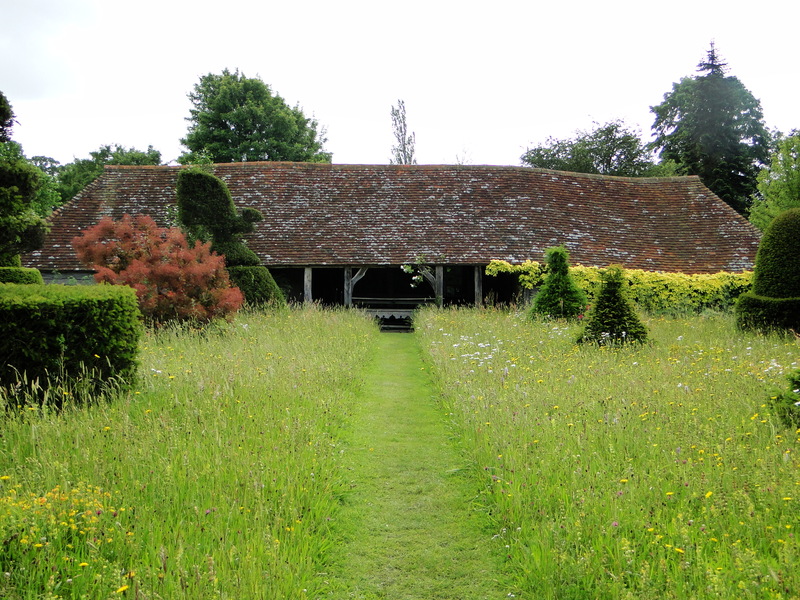 Although I’d much prefer it if councils used more of the meadow-style planting ideas championed by Sarah Raven and Nigel Dunnett. 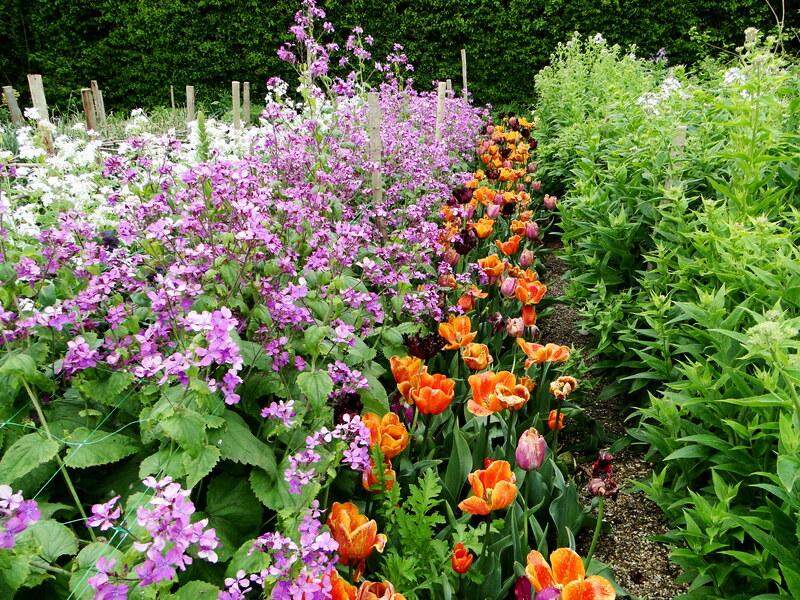 Garden centres and nurseries across the country though are stuffed with bedding plants from April through to June. If you want anything remotely different, something with a bit of height to sway in the breeze or something which provides food for pollinating insects so that the garden is buzzing with life then there’s very little choice in terms of annuals at all. 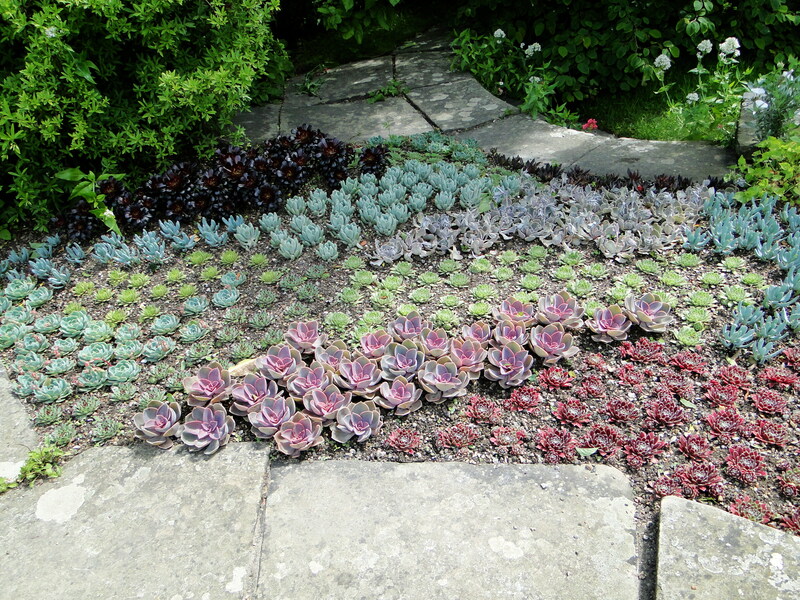 There’s tray upon tray of begonias which I hate with a passion and insipid looking lobelias and alyssum. These tiny, tight, compact plants make me think of a character from Dickens, their face all wizened and screwed up and unhappy with the world. 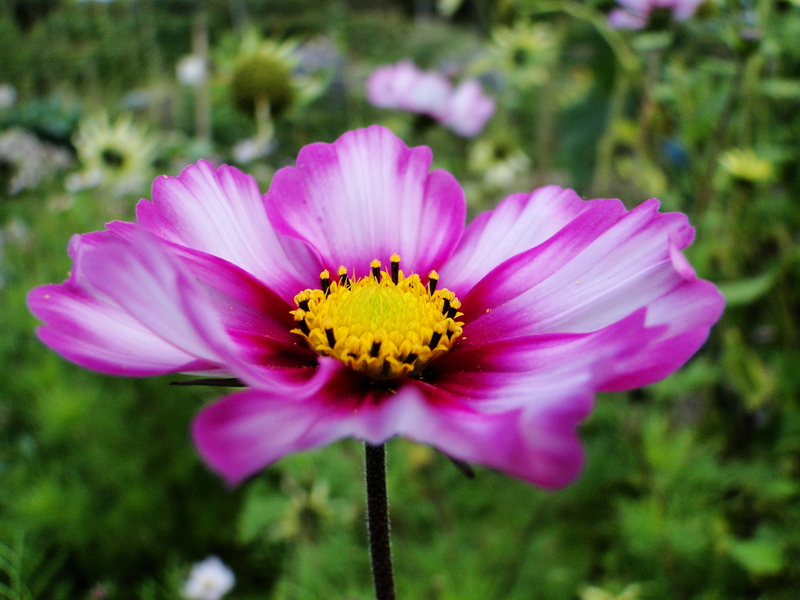 Plants like Cosmos ‘Candy Stripe’ on the other hand, now there’s a plant to love. Frothy, feathery foliage, stems at a height that you can see the flower without having to crouch down and put your back out and lots of pollen for passing bees, hoverflies and butterflies. 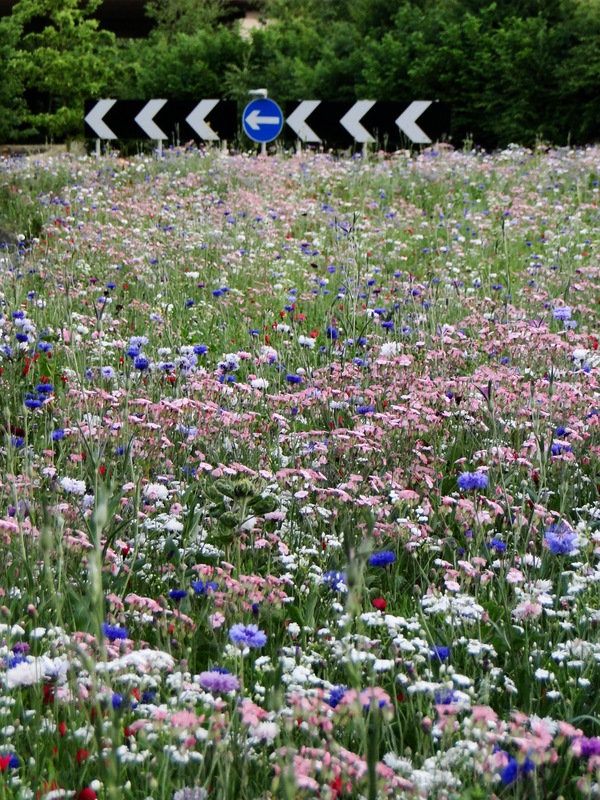 What about cornflowers, ammi, daucus and rudbeckia? These are all great plants. Now I know what you’re thinking, annuals are so easy to grow from seed and cheap you’d be crazy to buy them as plants from the garden centre. The thing is not everyone has the space, knowledge or inclination to grow these plants from seeds. 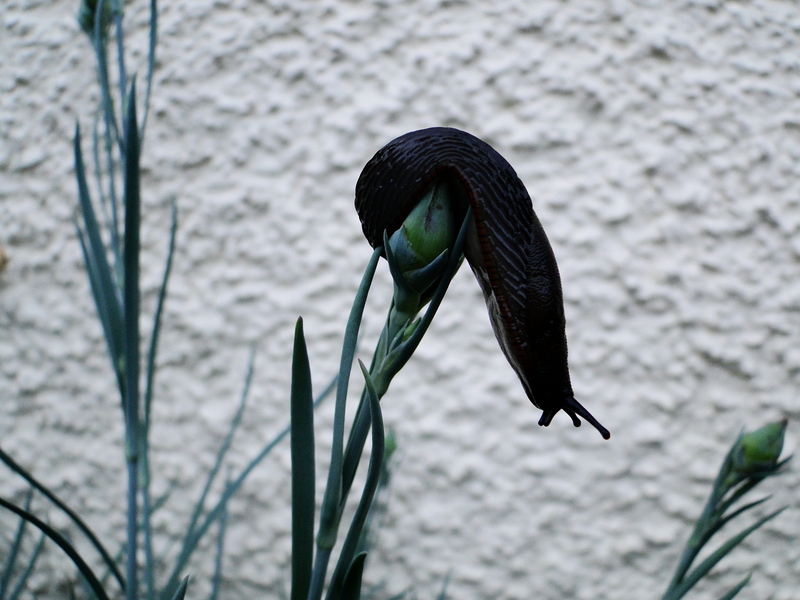 Even if you do slugs often scupper your plans and sometimes it’s too late to resow and start again. There are times when I’m willing to pay for the quick fix, the plant that someone else has grown and has got it to the stage that I just need to plant it in my sunny garden and within weeks it’ll be flowering. And what about biennials? So many people forget to sow them in June and July probably because they are recovering from the frantic April and May seed sowing and pricking out bonanza. 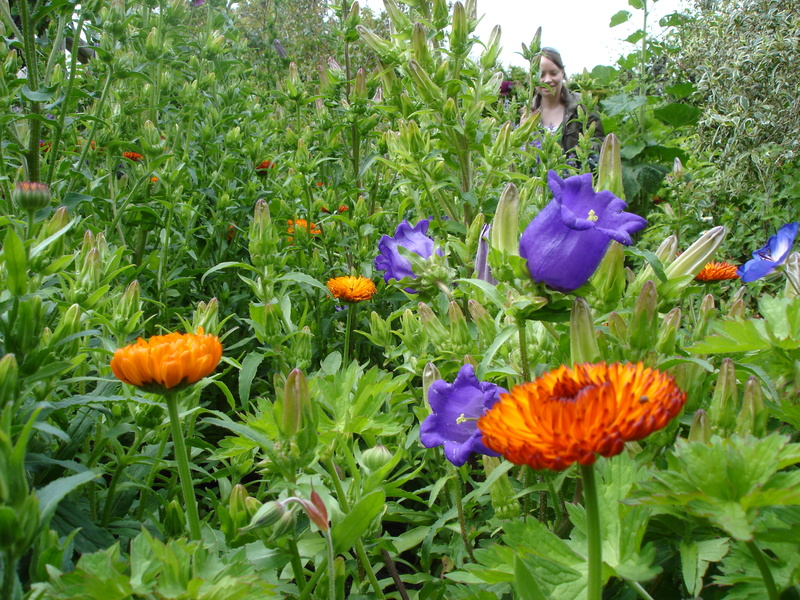 But, come September the only biennials for sale seem to be wallflowers and bedding ones at that. It’s a real pity as there are so many great plants that garden centres and nurseries could sell but they don’t. Disappointed by the lack of imagination on the annual plant front I turned to dahlias thinking there would at least be a good selection of those. There were a few at the first garden centre but none that really appealed so I thought I’d give some other places a try. 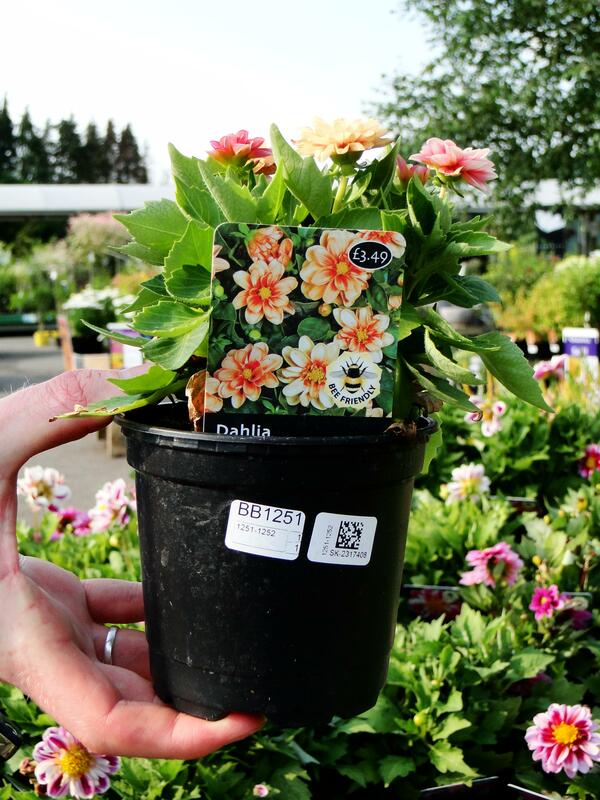 With each visit to another garden centre I saw exactly the same dahlia varieties on offer. It was the same with other plants too. So much for choice. Availability and choice for the garden centres themselves is clearly driven by what the wholesale nurseries are offering and, unfortunately for us the consumers, this means less choice rather than more. It feels as if the garden centre industry has succumbed to a sort of supermarketification. I have never really liked the diversification into sickly smelling candles, dubious fashion and travel sweets that so many garden centres have followed in recent years, but I accept that a seasonal business needs to look at other avenues for income. My real gripe is when they don’t get the core element of the business, the reason they are there in the first place, right. I see no point in having 5 independent nurseries within a 30 mile radius when they all sell exactly the same stock. The online nursery Crocus offers a couple of plants that I see as the new wave of ‘bedding’, taller plants, loved by insects such as Ammi majus and Orlaya grandiflora but mail order isn’t always what you’re looking for on a Saturday afternoon when the time allows for a spot of gardening and inspiration takes over. This is when the local garden centre should come into its own but for me it so rarely does. Specialist nurseries can be great. Knowledgeable owners and well looked after plants and the specialism means a much wider variety of plants to choose from. But I’ve yet to find one that has tackled the traditional bedding plant market and tried to offer something different. If you know of somewhere I’d love to hear about it. 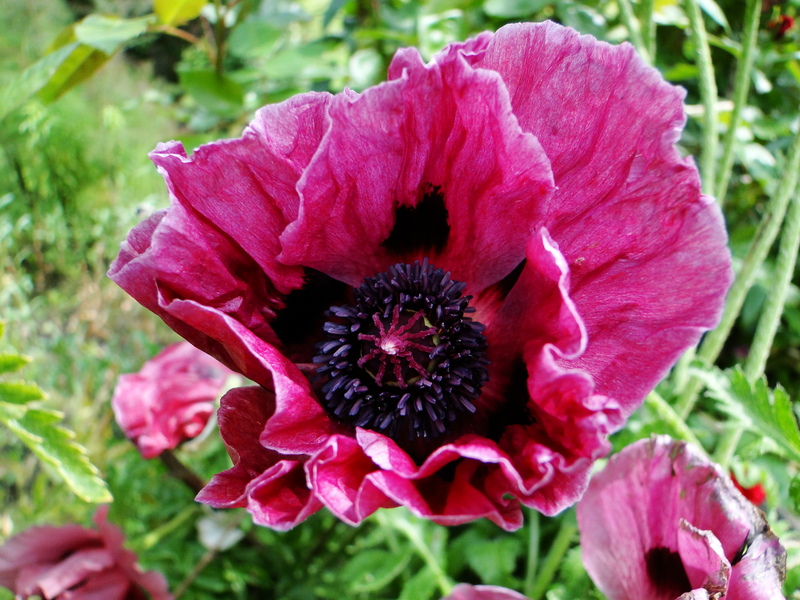 Wildlife friendly gardening is one of the biggest trends at the moment and annuals are some of the best plants for attracting insects and yet the garden centres, or certainly the ones around me, have yet to catch on. I wonder whether it’s because trays of small plants such as marigolds and petunias are so much easier to stack in racks and transport. I can appreciate the logistics but if this is what plant selling has become about, a pile it high sell it quick approach, lacking in inspiration and imagination then it’s sad. I leave you with what must be the world’s smallest dahlia. Need I say any more. I didn’t want to use the W word. I’m not quite ready to start thinking that we’re now heading in that direction again; I don’t feel I’ve had enough of a summer yet to prepare myself for the inevitable shortening of nights and even more miserable weather than we’ve had so far this year. 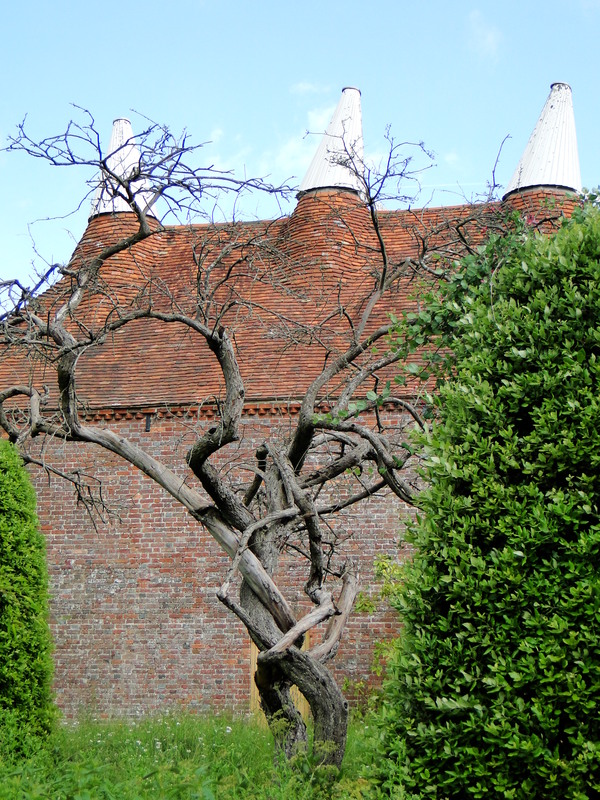 Much of gardening is about planning and looking forward, and at this time of year that unfortunately means accepting that autumn is just around the corner followed by the not particularly enticing prospect of winter. 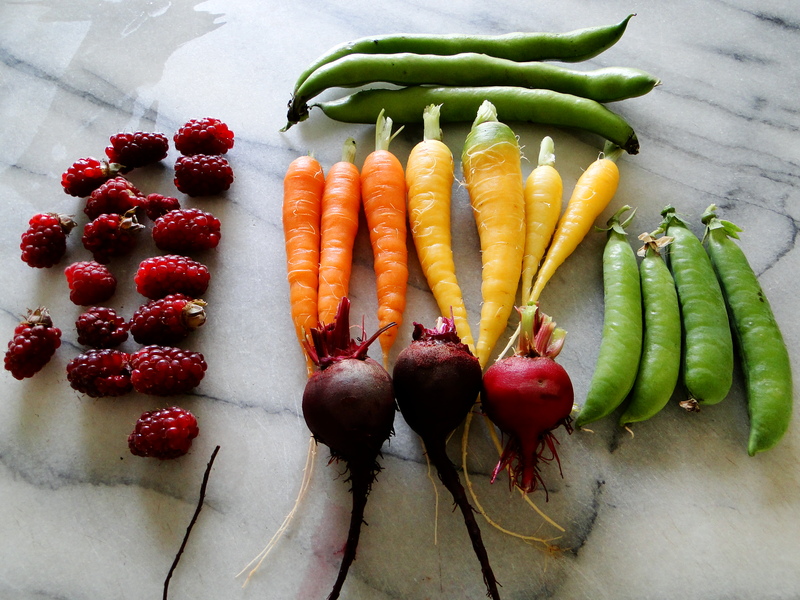 I had little in the way of winter crops last year on the plot. Some cavolo nero kale, and some leeks that were given to me as small seedlings by a fellow allotmenteer. This lack of winter produce was partly because it was my first year and getting the plot up and running for spring and summer had been enough of a task and partly because I thought I might be a bit of a fair weather gardener and wouldn’t actually venture up to the plot on cold, dark winters days. The reality was somewhat different, possibly because we had such a mild autumn which ran all the way up to Christmas. I found the allotment, even at that time of year, was a useful place to escape to, somewhere to clear my head, get some fresh air and peace and quiet. I actually liked the fact that we had a few, if sparse, crops to still be able to pick. So, this year, the plan is to have a little bit more on the plot through the leaner months. And, if this is the idea, I need to start planning and sowing. Of course, my planning hasn’t been that great, as I suddenly decided I’d like to give sprouting broccoli a try but had of course missed the sowing date. Fortunately, Delfland Organic Plants came to the rescue. 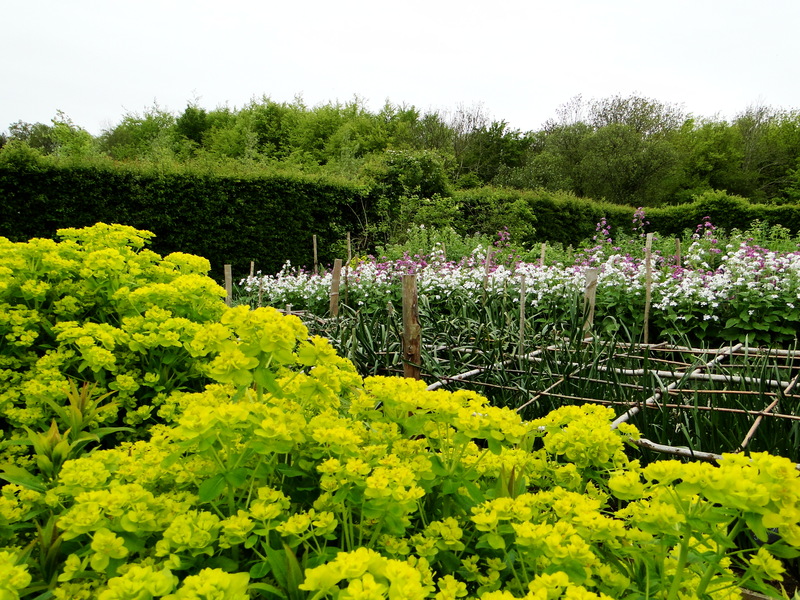 A few clicks on the computer and several days later I had 5 plug plants of white sprouting broccoli and 5 of a purple variety called ‘Claret’. 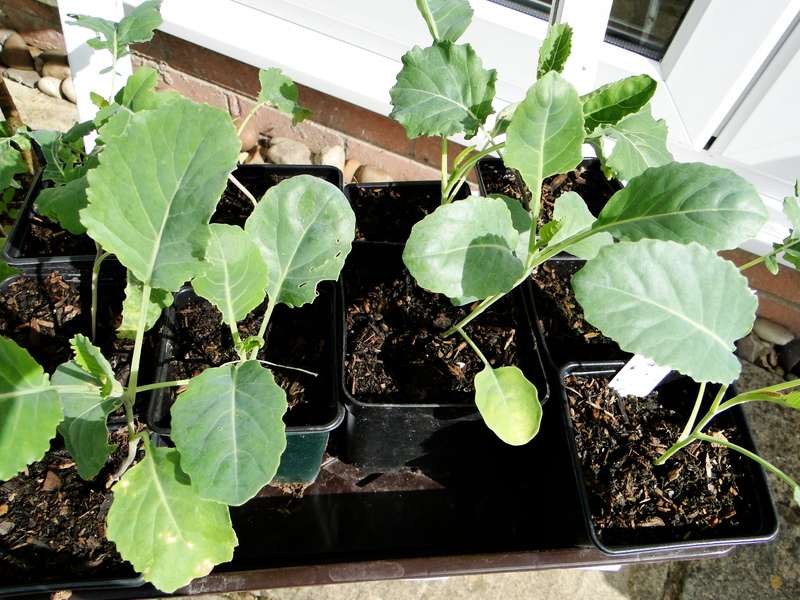 At the same time, I happened to read an article saying that it is actually better to sow your sprouting broccoli seeds a little later, say in July, and plant out your plants in August and have smaller plants that are still as productive. I felt quite pleased that I hadn’t missed the boat. My leeks are already planted up and celeriac, a crop that loves moisture, has thrived, in this my first attempt at growing and should be ready to harvest from October onwards. I think it’s beginners luck that, for this crop anyway, it has been such a wet year. So, to the seed sowing. I love spring greens and have just sown a variety called ‘Wintergreen’ which should be ready to pick from February. 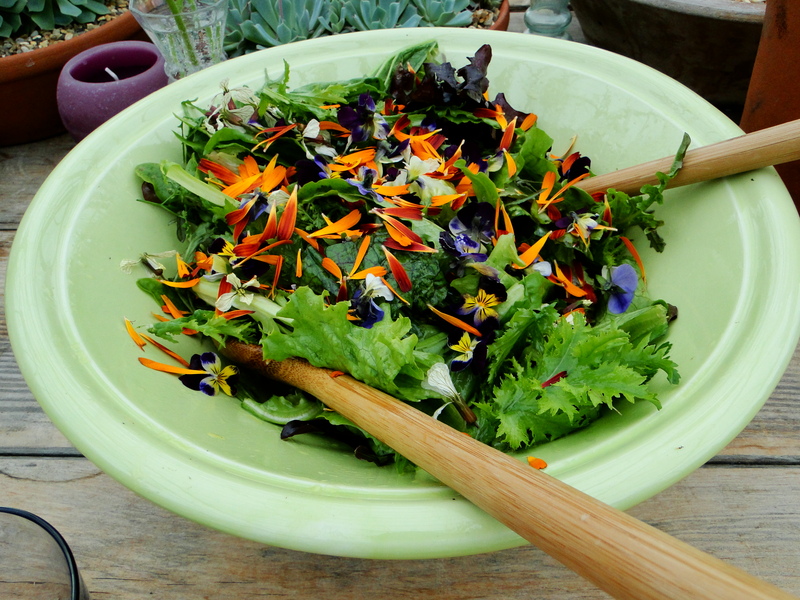 I’m hoping to be able to keep us supplied into the autumn at least with salads. 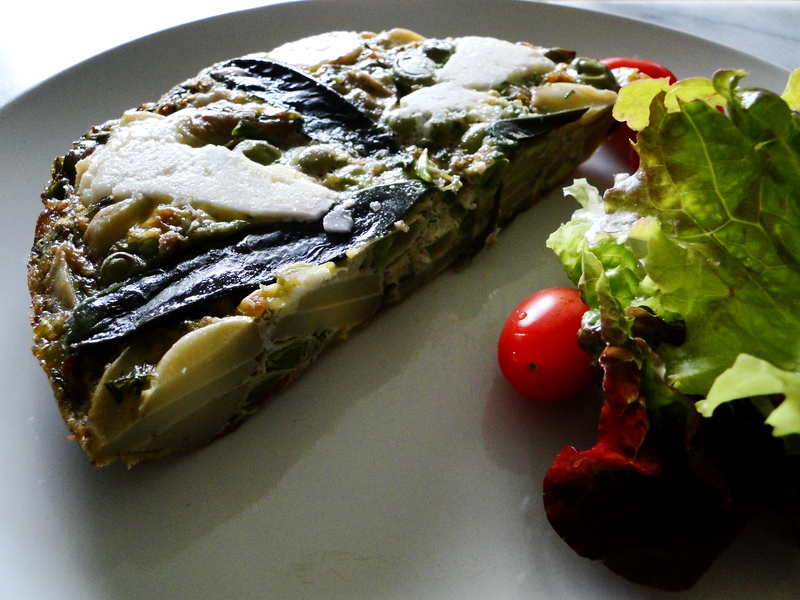 I won a packet of winter salad leaves from Sarah Raven in a competition through @Malvenmeet and Vegplotting. Thanks Michelle. Hopefully I can keep them out of reach of the slugs! I’ve discovered 4 packets of mizuna. I’m have no idea why I have so many but I guess I’d better get sowing some of them. There’s also ‘Reine de glace’, an excellent winter hardy variety of a hearting type lettuce, that I haven’t grown before. Now is the time to sow spinach. Notorious for bolting when it gets dry and hot, late summer is the best time to sow. I have a variety called ‘Red Cardinal’ which I’m hoping will add a little bit of colour to salads later in the year. Browsing around Nicky’s Nursery website I came across Italian red veined dandelion. Bitter leaves are, apparently, very good for stimulating the liver and are especially popular on the continent but much underutilised in British cooking. 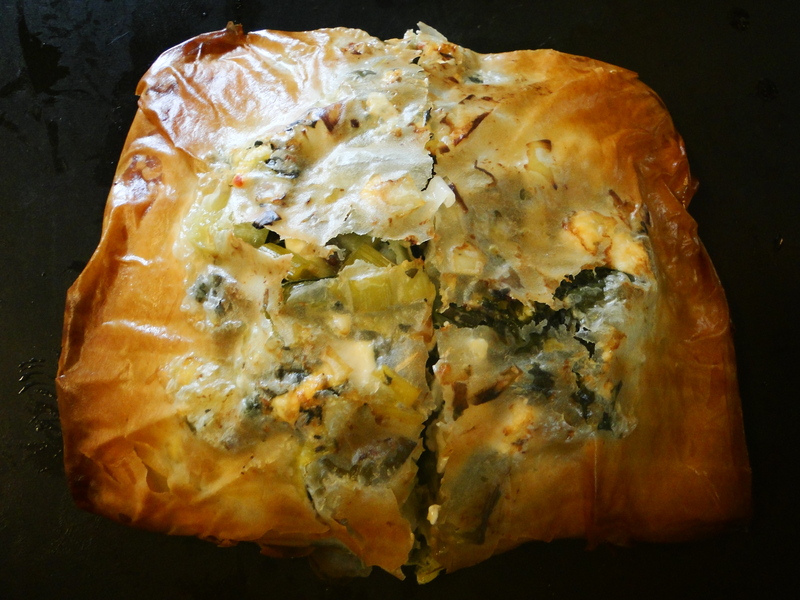 I have become quite partial to some of the forced chicory but without the space to do this myself, I thought I’d just try some bitter leaves instead. I can’t quite believe I’ve actually bought dandelion seeds. Alongside these seeds, I already have batches of Cima di rapa, an Italian sprouting broccoli. Unfortunately, on close inspection this morning several looked like their stems had rotted. I have a few spare, in the cold frame which seem fine at the moment, so all is not lost. 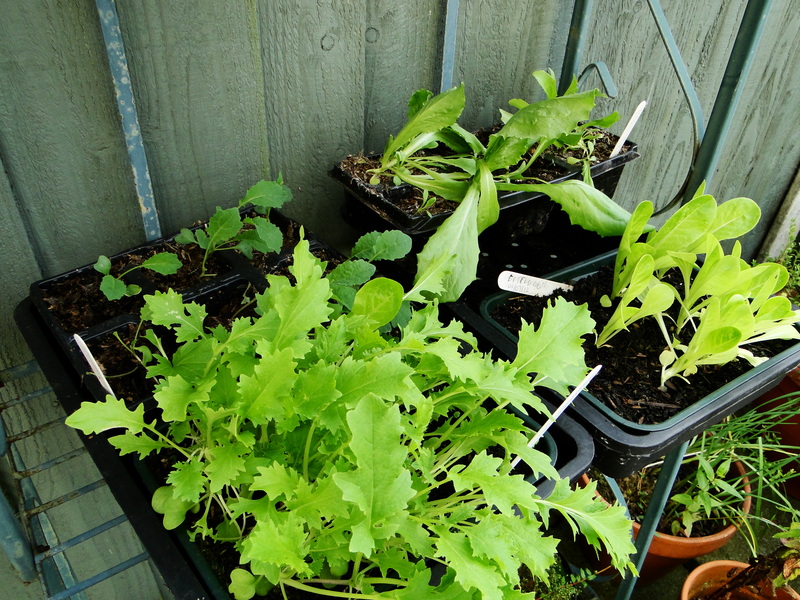 Russian red kale, cavolo nero and endive are all getting to a good size. I just need to clear some ground at the plot, so I can get a new crop of plants on the go. 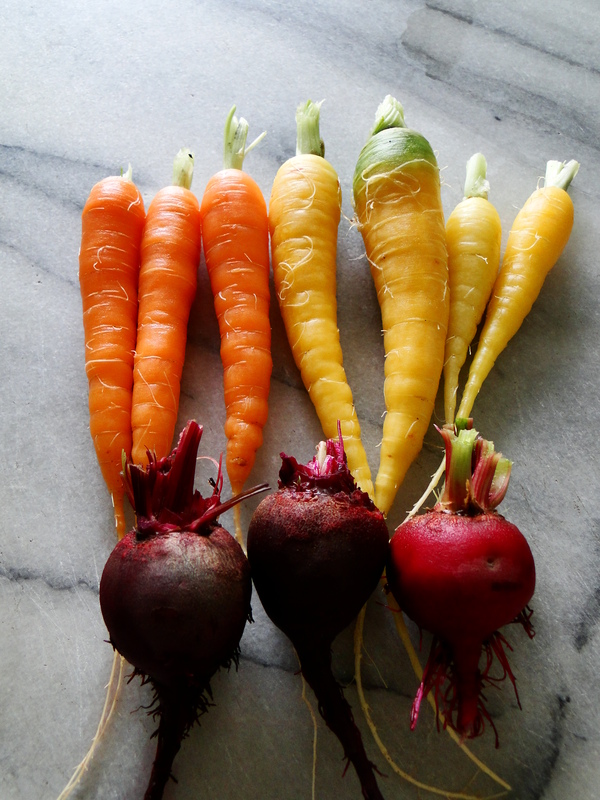 I’d love to hear about your must-have autumn and winter crops. You may have noticed that growing cut flowers is a bit of a passion of mine. 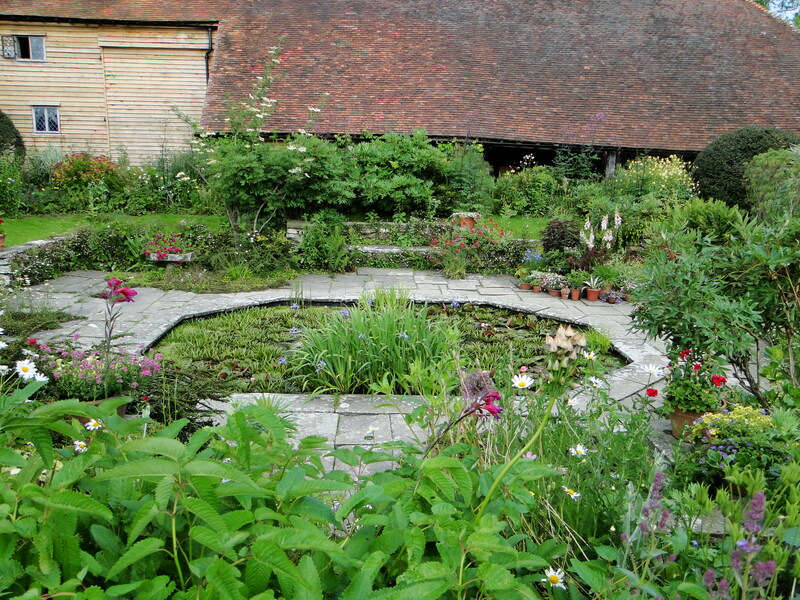 I first came across the idea that I could turn over a patch of land purely for the purpose of growing flowers to cut when I discovered Sarah Raven’s book The Cutting Garden. Inspired I used a part of my garden to cut flowers and then when I took on my allotment last year I decided to devote 3 beds to producing my own blooms. I love it; the sense of satisfaction is immense and I get huge pleasure from giving away bunches to friends and having the house filled with flowers. So it might have been a long way to go for a day, Wales to East Sussex, but when I was asked to attend a press day at Sarah Raven’s Cutting Garden it was just too good an opportunity to miss. Sarah Raven’s name is now synonymous with cut flowers and her style of naturalistic, billowing and slightly unkempt arrangements, that are the antithesis to the uniform, stiff and well-behaved bouquets on offer from most florists. It all started 18 years ago when she was working long hours as a doctor in a local hospital. With a young family she was looking for a way of earning money which gave her time to see her children and that idea was cut flowers. She had just moved to a farm in East Sussex and had land at her disposal so she trialled the idea of growing flowers as a business. She realised that maximising the productivity of every square inch of ground would be essential if her idea was to be a success. At the time no one was growing annuals, they had completely fallen out of favour but Sarah saw their potential; the key being the sheer number of flowers they produced over a season. Her business soon grew not just from selling flowers but also to teaching, writing and TV presenting, inspiring people like myself to grow their own cut flowers. As part of the day I was given a taster of the cut flower course she offers. Even for myself who has read and reread her books many times there was plenty to learn. 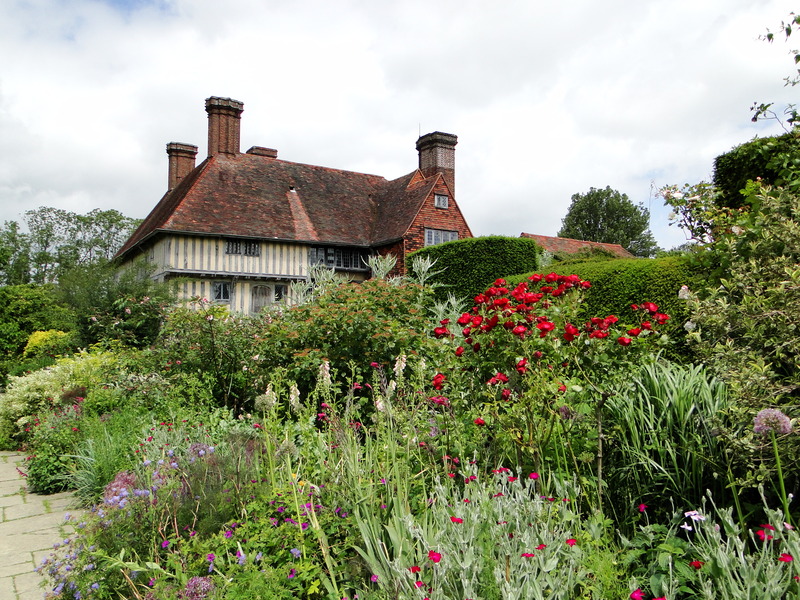 Her 2 acre garden maybe substantially bigger than most but after nearly 2 decades of trialling which plants are most productive, her knowledge makes it easier for those of us with limited space to maximise its use. For plants to gain a place in her garden they have to meet certain criteria, such as time from planting to harvesting, the length and size of the harvest, the cost of growing and their versatility. The idea she is working on at the moment is what she calls ‘plant lasagne’, the layering of plants in the soil to cram even more into a space. Similar to planting different bulbs in a container at different levels, Sarah is currently growing artichokes, alliums and dahlias in beds producing high quantities of flowers and also an edible crop. I loved the colour contrast of redbor kale and the pinky/apricot coloured Tulip ‘Menton’ that were growing in her vegetable garden and is an idea that may well make its way onto my allotment. 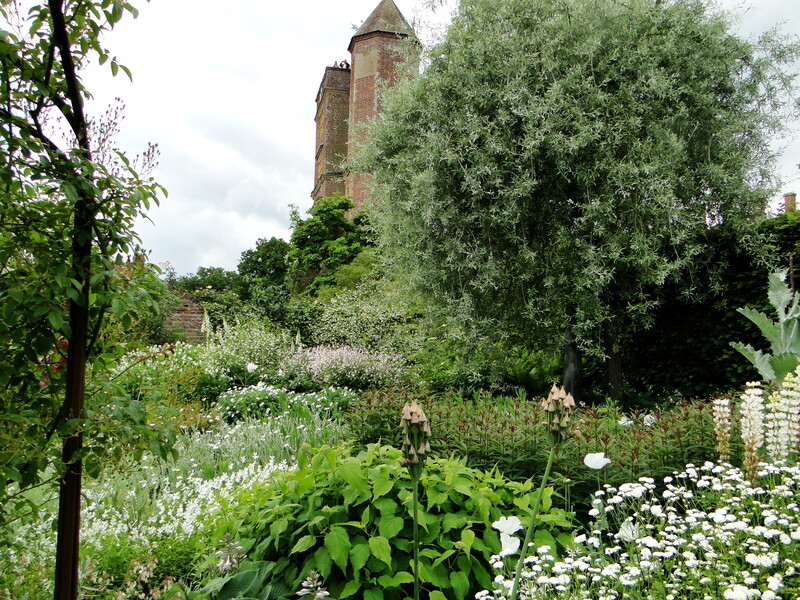 The Cutting Garden at Perch Hill has four seasons which are dictated not by the actual season but by the plants that dominate that period. 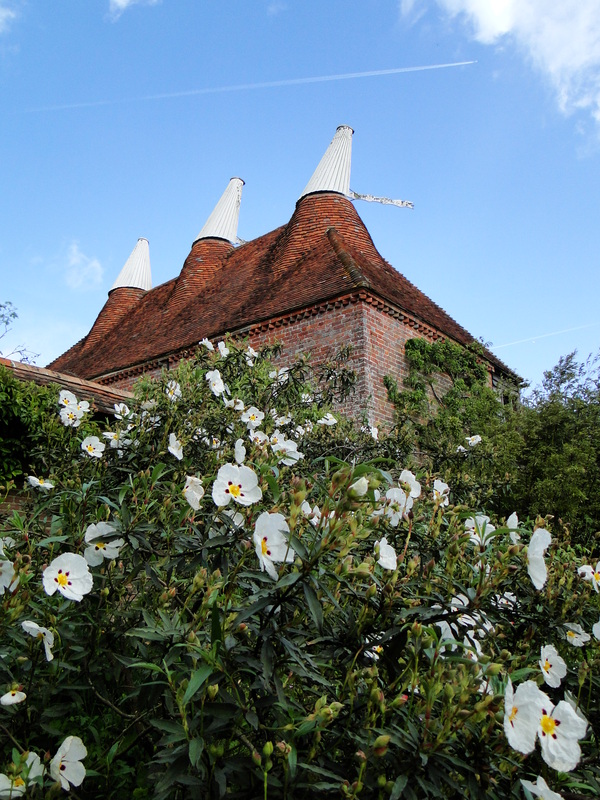 So season 1 is all about the bulbs with some biennials thrown in and runs from March to mid May, season 2 lasts from mid may to mid July and is the time for hardy annuals, which Sarah sows the bulk of in the autumn. Between mid July and September, season 3, the half-hardy annuals, tender perennials and dahlias take over. The final season can last, in this milder part of Britain, right up until Christmas and is the time for dahlias and chrysanthemums. This different way of looking at the growing season will certainly influence my planning for my own patch. 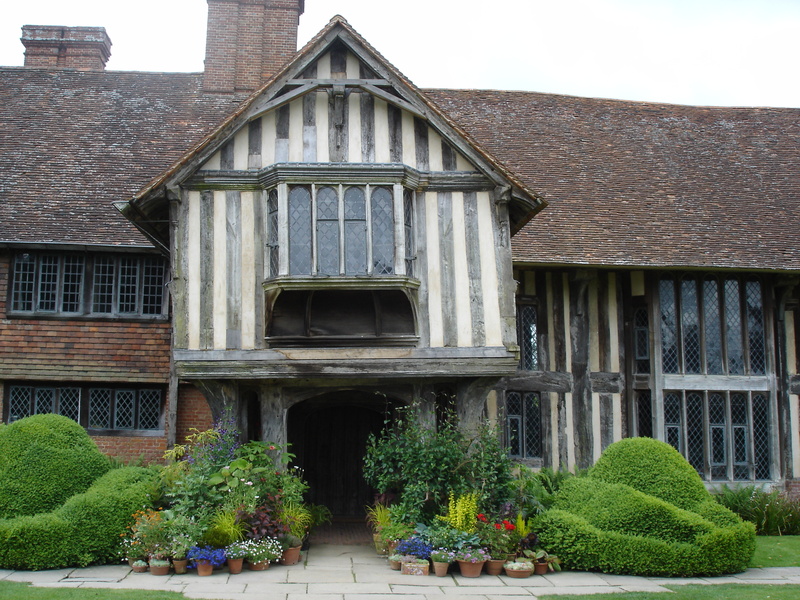 A tour of the garden and a taster of her vegetable growing course were equally fascinating and informative but the icing on the cake was a demonstration of creating a hand tied bouquet in her inimitable style. Tips included holding a mass of flowers if you only have small hands, the easiest way to tie the bouquet without it falling to pieces and how to create a sieve with the foliage to give the bouquet structure. I left with masses of notes and a head swirling with ideas. Maybe next year I might have to devote a fourth bed to cut flowers!! 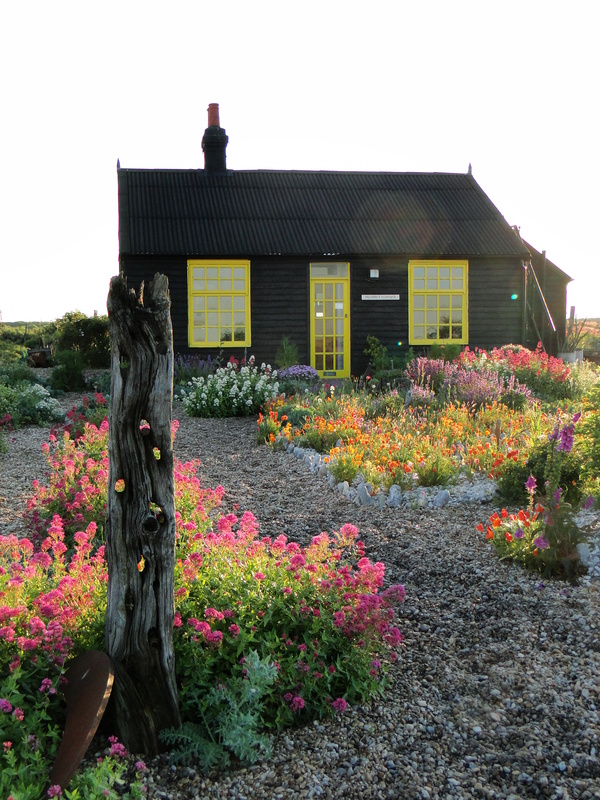 For more information about Sarah Raven, her garden and courses visit her website. 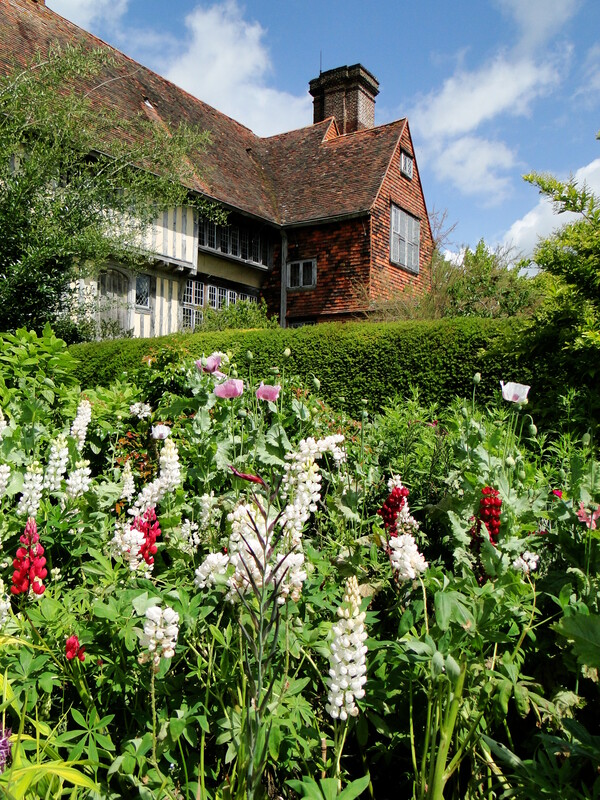 Perch Hill is open on selected days throughout the summer. So we’re well into the main seed sowing period of the gardening year. It’s a time of great anticipation, with compost, trays and seeds at the ready. It’s a crucial time for every gardener, a window in which the plants that will feed us and provide colourful flowers throughout the summer and into the autumn are started into life. 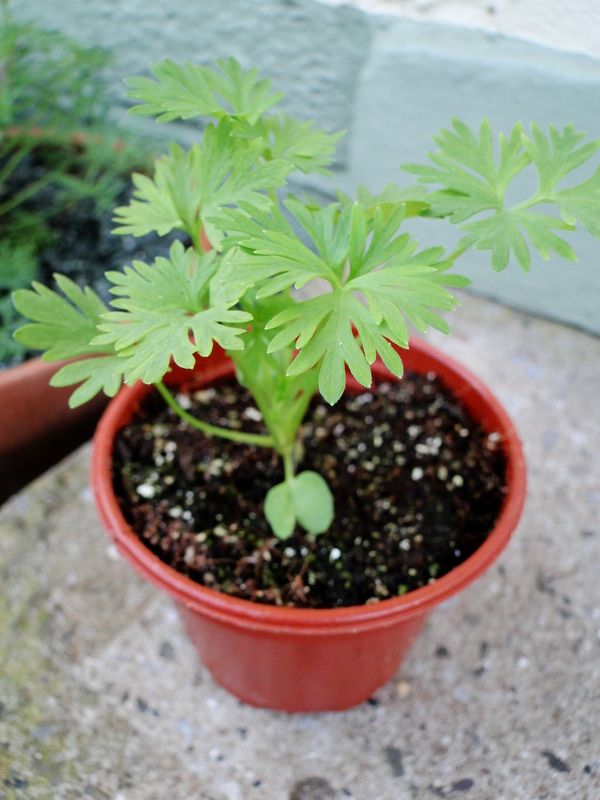 It can be make or break for some plants which need a long growing season to reach maturity, such as celeriac and parsnip. If these plants miss their window of opportunity that’s your chance gone for another year. So it can be incredibly frustrating, to say the least when seeds don’t appear. We’ve all experienced that sparsely populated compost where there should have been a sea of shoots or even worse the completely bare seed tray. Of course, we blame ourselves. We must have done something wrong. Did we sow them too deep or too shallow? Was the compost too dry and too wet? Was it too cold for them to germinate? All of these are possibilities but how many of us think it might be the seed that is the problem? It might be a more likely explanation than gardeners realise. In recent years the consumer magazine Which has carried out research to determine the germination rates of selected seeds from some of the main seed suppliers in the UK. In 2007 it discovered that significantly high percentages of seeds were actually dead at the time of purchase. One company’s Delphinium seed were found, when analysed, to be 99% dead and the other 1% were unhealthy and just 15% of seeds of a variety of lettuce produced healthy plants (figures were taken from a report in The Daily Telegraph). Two years later they carried out more tests and found 7 out of 17 seed supplying companies failed to meet minimum germination standards with spring onion ‘White Lisbon’ and only 27% of a variety of pelargonium germinated. They did however praise several companies, including Nicky’s Nursery and Dobies for their overall seed health. 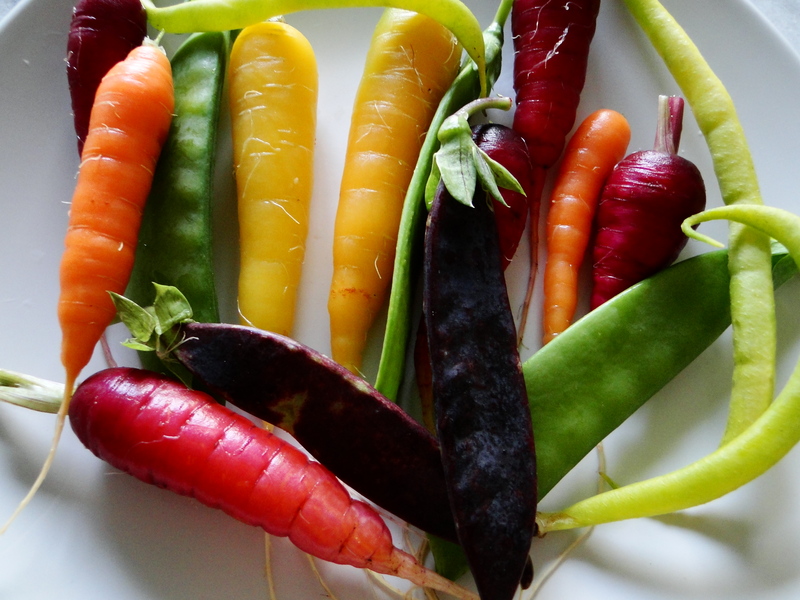 There are legal standards set by the EU for the germination of vegetable seeds. These minimum germination percentages vary according to different plants to reflect the natural viabilities of different seeds, for example it is 80% minimum germination for cucumbers and runner beans and 65% for carrots and leeks. I suppose I hadn’t really given it much thought but it is surprising and sobering to realise that a number of the seeds we buy are already dead, even if they are meeting the legal requirements and as Which discovered many are not even meeting these. Flower seeds are not covered by any minimum standards at all which seems quite shocking to me. I can’t think of any products that we purchase that don’t have to meet some sort of minimum standard. I can quite easily spend £20 – £30 on flower seeds in a year and the thought that I’m not getting what I paid for is annoying. My own experience so far this year has been mixed. Most of the seeds have germinated well, particularly sweet peas, celeriac and lettuce but I’ve had my fair share of frustrations. 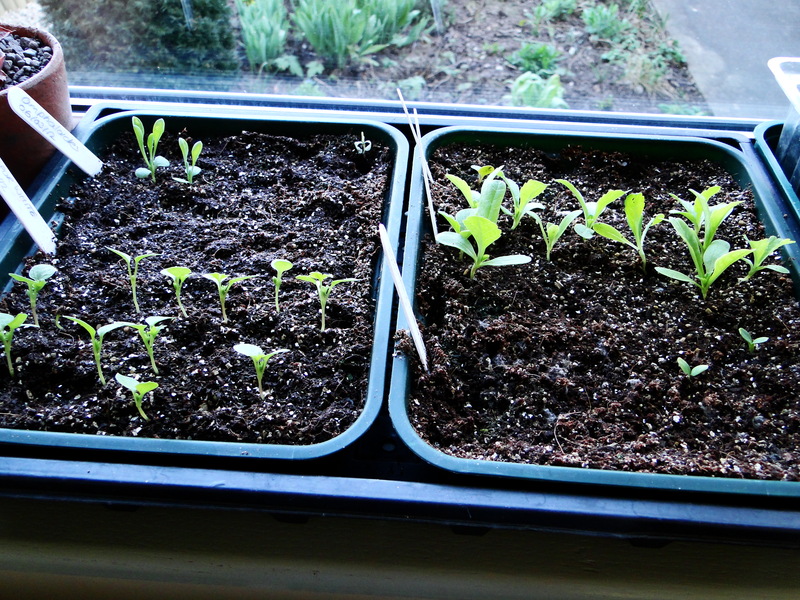 I sowed one seed tray, half with blue larkspur and the other half white larkspur. They had exactly the same conditions. The blue larkspur are now good-sized plants hardening off in my cold frame, not one white larkspur appeared though. I resowed and 3 have so far germinated which is not enough for my cutting patch. Sarah Raven, who I purchased the seed from said they knew of no other problems with the seed but promptly sent out another packet and I have now sown another batch. Rudbeckia ‘Cappucino’ is another seed I have had problems with, 2 years in a row. The contrast between this variety and another Rudbeckia variety ‘Prairie Sun’ is incredible, with virtually every seed of the latter germinating and a measly 1 out of 20 from the ‘Cappucino’ germinating. With my cutting patch I’m trying to grow lots of varieties in small groups of between 6 and 10. With the confined growing space of window sills and cold frames, the problems of patchy germination or complete no-shows are heightened. I, like many other gardeners don’t have the space to sow lots of seed en masse. Perhaps though, one of the main reasons why this problem seems to be brushed under the carpet is our reluctance as gardeners to complain when our seeds don’t perform as expected. I am guilty of this, too. Some companies are reluctant to admit there is a problem and insist it must be the gardener at fault and what gardener wants their seed growing prowess called into disrepute? Others seem to have a better understanding of customer service, such as Sarah Raven. I was talking to a commercial grower recently who has experienced the vagaries of seed germination and the reluctance of companies to acknowledge the problem and he said we should all complain more. It is only then that the companies would have to take more notice of the issue. I’d love to hear if you’ve suffered from similar seed germinating problems and whether you’ve complained or not. Gardeners everywhere understand how annoying and frustrating perennial weeds can be. For years people have turned to chemicals to solve the problem but as fewer chemicals are now available and more of us want to grow organically could growing a particular plant, Tagetes minuta, be the answer. Annual weeds maybe the bain of a gardener’s life, especially in spring when the increasing light levels and warm soil mean they appear all over the place. However, a spot of regular hoeing is all that is needed to keep on top of these weeds. Perennial weeds are another matter. Some, such as daisies and plantain are easily removed but the discovery of some perennial weeds can strike terror into the heart of a gardener. There is a sinking feeling when you come across ground elder, bindweed and, heaven forbid, Japanese knotweed. Most of us would probably turn to glyphosate, a systemic weedkiller, which means it travels through the leaves, into the main body of the plant, where it is transported through to the roots killing the whole plant. Although glyphosate is deemed to be a fairly safe chemical because it is broken down quickly in the soil, there is talk that it may be banned by Europe in the coming years and I think most of us would ultimately prefer not to use any chemicals. So could this be where Tagetes minuta comes into it’s own. It’s common name, which I love is ‘stinking roger’ because of the smell given off by it’s leaves. A native of South America it is a half hardy annual which can grow up to 2 metres. It certainly isn’t a looker with tiny nondescript flowers but it’s what is going on in the soil that is important. Tagetes minuta exudes chemicals from its roots which repel weeds such as couch grass, bindweed and ground elder. This is a biological phenomenon called allelopathy, when one organism produces one or more chemicals which influence the growth and ultimately the survival of other organisms. Tagetes’ ability to cleanse the soil was discovered by a bulb grower in Holland in the 1940s. After the bulb harvest and before he planted his next crop he grew some African marigolds (Tagetes erecta) to sell as cut flowers. He started to notice that land where the marigolds had been growing no longer had problems with eelworms, tiny worms that burrow into bulbs and tubers. Over the next couple of years he continued to clear strips and grow these marigolds, curing his soil of ‘root rot’. He told the local agricultural research team who studied the marigolds and produced a report which became known as ‘The Tagetes Effect’. The Henry Doubleday Research Association (HDRA), now known as Garden Organic, then took up the baton and started their own research to see if there were other members of the Tagetes family that could combat problems such as potato cyst eelworm. Their quest led them to South America where the first potatoes had been grown by pre-Inca civilisations. Land was limited with crops being grown on terraces. There wasn’t the space to rotate their crops and yet they had no eelworms in the soil and this was down to Tagetes minuta which had sacred status amongst these early people. Working with Swansea University the Henry Doubleday Research Association discovered the 5 important compounds in Tagetes minuta and then a member of HDRA grew some in the hope it would also cure a wireworm problem. It didn’t, but it did clear the soil of ground elder. It seems that the same chemical compounds that deter pests in the soil also interfere with the life cycle of some particularly invasive weeds. Sarah Raven has recently used it to clear a bed of ground elder. A note of caution however, Tagetes minuta itself is actually considered a weed in over 35 countries, including the USA. It is only a problem though if allowed to set seed which is unlikely if grown in Britain because it flowers late, in September/October. It could be used as a green manure, grown in an area with pests or weed problems and then cut down in autumn with the bushy green foliage being added to the compost heap. Chemicals released from the plant when touched can cause dermatitis so it is advised to wear gloves when handling. Many of us have used members of the Tagetes family as companion plants for tomatoes to repel aphids but it’s fascinating to discover that plants themselves could hold the key for future ways of controlling pests and diseases. Seed available from Sarah Raven, Chiltern Seeds and Nicky’s Nursery. What do you wear when gardening? 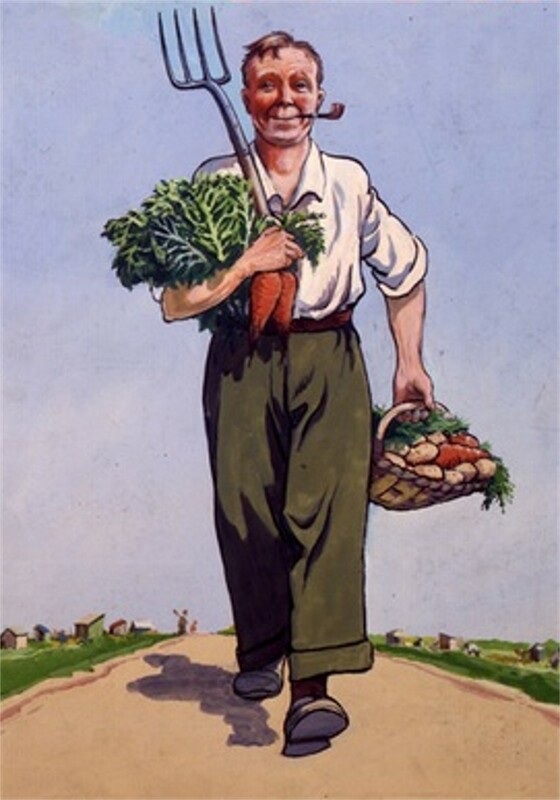 So what do you wear when you’re gardening or at the allotment? Are you like Alan Titchmarsh wearing jeans, a jumper and boots? Do you emulate Monty Don and his intriguing uniform of blue shirt come smock? I always wondered where he got them from until I came across an ironmongers in Ludlow that had some in stock and wondered whether this was his source. Maybe you manage to garden in a skirt a la Sarah Raven and Alys Fowler or with funky, chunky scarves like Carol Klein. Me . . . . well I like to think of my gardening attire as ‘scruffbag chic’. I’m messy at the best of times, although not on a par with Wellyman whose record is 2 minutes wearing a clean shirt before food ended up on it. Put me somewhere with soil, tomato feed and flower pollen and there really is no point wearing anything that is considered ‘good’. I’d love to look half as elegant as Rachel de Thame does in her Barbours, even when she’s digging up an enormous shrub. But it isn’t to be. You will find me in jeans that are paint splattered and holey, teemed with Wellyman’s jumpers that have shrunk in the wash and an oversized fleece which has splatters of ‘Wild Thyme’ paint on it from painting the fence last year. Of course, there are my trusty green wellies but even these are looking past their best and have traces of paint on them. I told you I was messy. The thing is I actually quite like the opportunity to not have to worry about how I look. It makes a refreshing change when there is so much focus on fake tans, designer clothes and botox everywhere you look now. A woman did turn up at the plot last year in big ‘Posh Spice’ style sunglasses, smart dark jeans and pristine black wellies. She planted up some strawberries and then I never saw her again. Allotments really aren’t the place to be precious about appearances. As I found out early on when I was caught in a torrential downpour. With nowhere to shelter on the plot, I tidied up and set off for home. By the time I got there I was completely drenched, hair plastered to my head, rivers of water running down my face and soaked right through. I got some strange looks from people as they drove past in their cars cocooned from the elements. Fortunately, there was nobody about the other day to witness my trouser incident. Having decided to go to the plot I got changed into my scruffs. One pair of jeans had a hole in the crotch and were waiting to be patched up, my other pair had a gaping hole in the thigh and it was cold and I didn’t want a draught. After some digging around in a drawer I found another pair, got changed and wandered up to the allotment. Now these jeans normally need a belt but when I had put them on they had felt fine. I just thought that I might need to do a bit more exercise after Christmas excesses, so I didn’t bother with the belt. However, after 10 minutes or so of bending and digging something didn’t feel quite right. It was then I discovered the jeans had slipped right down and I was now displaying my knickers to the world, like some teenage boy in his deliberately saggy trousers. I am just so grateful it was January and I was alone with my embarrassment and that my oversized fleece pulled down as far as it would go protected my modesty on the walk home. Note to self, those jeans need a belt next time.